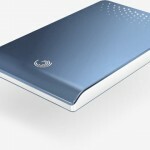 I’m sure that, by now, you’ve all seen commercials for the new Seagate FreeAgent Go drives. These things look seriously cool. The drives themselves are about the size of an older style Palm Pilot or Sony Clio (probably about 3.5″ x 5″ x .5″) and are available in sizes up to 500 gigabytes. Right now, Seagate is offering certain colors of the 500 gig Go drive for $149.99. I have a 750 gigabyte Seagate external drive on my desk for backing up all of my files on a regular basis, but it’s at lesat four to five times the size of these new Go drives. I can only imagine how nice it would be to be able to back up most of my files (I have 550 gigs of internal hard drive space on my computer) on a drive small enough to fit in my pocket. I continue to be amazed at the way technology is evolving, and the fact that storage devices are getting smaller and smaller while offering more and more capacity. The only problem I can see coming from all of these developments is the fact that we are probably all running out of USB ports on our computers. If they keep developing all of these devices the way they are, our PCs are going to require power supplies as large as old television sets, just to power all of our USB devices. Sure, you can pick up an extra USB hub, but if your power supply isn’t prepared to run all of those extra devices, you’re kind of out of luck. Would You Like to see a Boxee Set-Top Box? I just bought a free agent go drive. I downloaded about 50 gigs of music in. I try to plug to my car stereo USB and I get Error 23.